Harrison Freed at the plate for the Bulldogs. Freed leads the team in batting average, hits and home runs among other categories. Jimmy Lafakis/Collegian file photo. 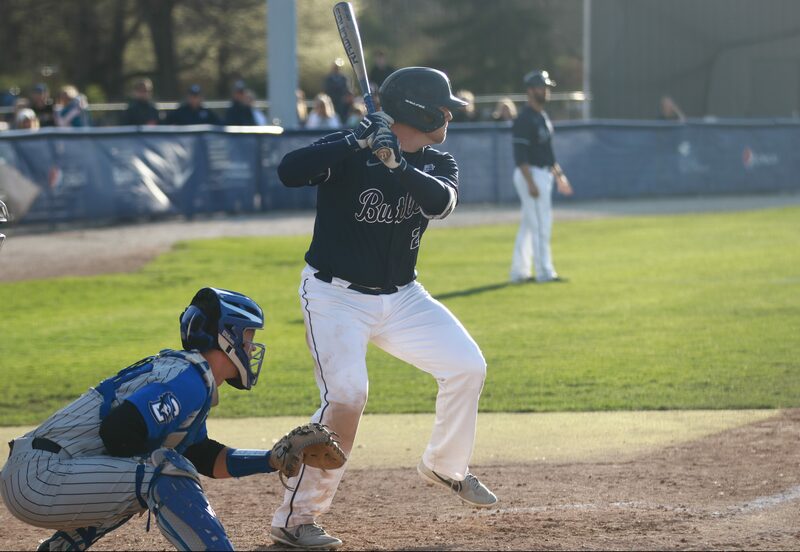 When Harrison Freed stepped on to Butler’s campus as a freshman in the fall of 2016, it was his only opportunity to play baseball at the Division I level. Coming from the Indianapolis suburb of Westfield, Freed’s high school career was far from the decorated career of his high school and current teammate Ryan Pepiot. Freed’s teammates in high school knew the talent level he had, but injuries didn’t allow Harrison to showcase those skills to college coaches. Freed hit two grand slams in the span of three games in early April. But back as a freshman, he was only offered a preferred walk-on position, by then-coach Steve Farley. Freed would consider himself lucky if injuries were the worst thing to happen to him at Westfield High School, though. In July of 2013, Freed’s aunt was murdered on the day her divorce was to be finalized. Those closest to Freed felt how much his aunt meant to him and his brother. The news sent shockwaves through Westfield High School and the local community. Despite the nearly six years since his aunt’s death, Harrison said he never allows himself to forget the impact she has had on his life. He played some of his best baseball with her in mind. One day after the fourth anniversary of her passing, Freed hit four home runs in a game for the DC Grays of the Cal Ripken League, while his older brother Jackson had a monster game for the MedHat Mavericks in the same week. Fast forward six years, Freed has blossomed into one of the hottest hitters in college baseball. As a junior, Freed holds team-highs with a .380 batting average, 30 runs, 52 hits, six doubles, three triples, 12 home runs, 49 RBIs — more than double the next player — and a .730 slugging percentage as of Monday. For his efforts, Freed was named Big East Player of the Week in early March. Notably, he also has started in every single game the Bulldogs have played so far this year and the outfielder has not yet coughed up a single error. And while his junior campaign comes and goes, Freed’s most exciting baseball games are still ahead. This upcoming summer, Freed is set to compete in the Cape Cod Baseball League, which hosts some of the best collegiate baseball players in the country. If it sounds familiar, it’s because Pepiot played in the Cape Cod League just a summer ago. With so many players in the Cape Cod League eventually playing professional baseball one day, Freed knows how competitive professional baseball is to get into, and that’s what excites him. “He’ll either play professional baseball or manage his dad’s jewelry shop,” Pepiot said. “He’ll probably invent some video game,” Schrage said of the Fortnite-loving Freed. Through the childhood tragedy and the trials of being injured all throughout his high school career, Freed has grinded his way to the heights he has reached in his baseball career. Although a cliche, Freed oozes the Butler Way. And if given the opportunity to play on a Major League field one day, he has proven that nothing can break him down. Freed’s been through the ringer and is still smiling on top. “I took the opportunities given to me and ran with me and came out on top, I’d say,” Freed said.